The Chinese currency is known as Renminbi (RMB) 人民币 (rén mín bì) which translates as 'people's currency'. The main unit is the yuan (the usual character for yuan is 元, although in formal situations you may see 圆. The symbol ¥ is more commonly used). The yuan is popularly referred to as 'kuai' (块 kuài ) in spoken language. There are currently seven banknotes with Yuan values: ¥100, ¥50, ¥20, ¥10, ¥5, ¥2 and ¥1. Between 1999 and 2004, the Chinese authorities introduced new designs for these banknotes (except the ¥2 which is being phased out). This was mainly an effort to reduce counterfeiting, which is not uncommon. All Chinese people will carefully check notes before accepting change, especially ¥100 and ¥50 notes. Even in banks it is considered not only acceptable, but pretty much essential to examine every note carefully before leaving the counter. Be particularly wary of Guangzhou taxi drivers who like to unload false notes on unsuspecting foreigners. The old designs are still legal tender, but are rarely seen today. The Yuan is subdivided into 10 Jiao (角 jiǎo), colloquially known as Mao (毛 máo). There are three notes: 5, 2 and 1. The Jiao is further divided into 10 Fen (分 fēn). These are virtually worthless and are rarely seen now. 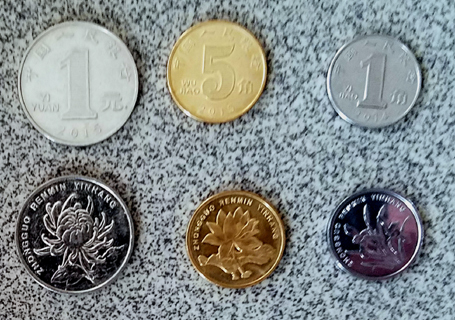 There are also 1 元, 5 角 and 1 角 coins. Click here to see the banknotes . There is no limit to the amount of non-Chinese currency you may bring in to China, although you are supposed to declare larger amounts (over US$ 5,000). It is relatively simple to change money into RMB in branches of the Bank of China. Larger hotels also have currency exchange, but some will only cater for guests. There is no competition in exchange rates. The standard rate applies everywhere. It is illegal (and risky!) to exchange money outside of the banking system. NOTE: Banks will only accept notes in perfect condition. The smallest tear or defacement will result in your cash being refused. UK visitors should note that Scottish or Northern Ireland bank notes are NOT accepted. The number of currencies accepted is limited. Check Major travellers' cheques are accepted. More problematic is changing RMB back to foreign currency. The standard contract stipulates that a certain percentage of your salary can be exchanged. This is normally set at 30%, but can be higher. However, contracts aside, it can prove difficult to make the actual exchange. Chinese law states that no more than ¥20,000 in RMB may be taken out of the country. That said, I have never been asked to show my money on exit. RMB cannot easily be exchanged in the US or Europe (apart from Switzerland!). It is possible to exchange RMB in Exchange Offices in Australia (not the banks) but only at an extremely poor rate. It is possible to change RMB in Hong Kong, Macoa and in Vietnam and Bangkok. For current exchange rates click here. It is possible to open bank accounts in China. For foreign currency dealings it is probably best to use the Bank of China. CITIC are also recommended by many people, but only have branches in the larger cities. It is only very recently that other banks have been allowed to deal in foreign currencies and they have little experience of how to go about it. RMB and Foreign Currency accounts are both available as are mixed currency accounts. Note that the latter do not let you deposit RMB and withdraw US$ etc. You can only withdraw in the currency in which you made the original deposit. ATM cards are also available, but some only work in the province in which they are issued. It is also possible to transfer money from abroad into your Chinese bank account. All these services work fairly well in the larger cities be can be more difficult in smaller towns. Dealing with the bank can be a frustrating experience. Plan on spending a while on even the simplest transaction. The clerks like to take their time, triple checking everything, recording everything on small pieces of paper then gluing them together, wandering off to take phone calls, holding discussions with other staff about your passport photograph etc. Changing travellers' cheques can be particularly tortuous. Each cheque will be examined in great detail and cross-referenced against several lists of 'stolen' cheques before you get your cash. The use of credit and charge cards is growing in China, but they are still a relatively new concept. Visa, Mastercard, Amex are all known. They are only really useful in the large cities and are generally only accepted in the larger hotels and tourist shops. Note that train and bus stations do not accept cards. Very popular in recent years, cell phone payments through Alipay and WeChat and some others offer convenience. They can be linked to most bank accounts, but some foreigners have had difficulty. I use WeChat almost all the time.